There will be strong representation from the North West in the Northern Ireland Under-21s squad that takes on Iceland and Slovakia next week with Derry City duo Jamie McDonagh and Alistair Roy both selected by head coach Ian Baraclough. Ex-Candystripe Rory Holden, who is now plying his trade with Bristol City in the English Championship, is also set to take part. 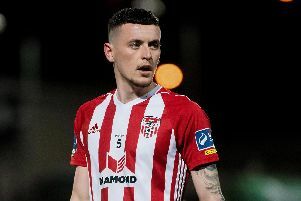 Baraclough knows that wins away to Iceland and home against Slovakia will give his side an outside chance of qualifying for a play-off for a place at next year’s U21 Euros. He admitted he had to make some tough calls when he was putting his squad together for the game against Iceland U21s in Reykjavik on October 11, and Slovakia U21s in the National Football Stadium at Windsor Park on October 16. Coleraine striker Jamie McGonigle, who is a Dungiven Celtic product and was a late call-up for the games against Luxembourg and Spain after Oxford United winger Gavin Whyte was promoted to the senior squad, is not included this time. The U21s manager said McGonigle was unlucky not to be selected. “Ryan Johnson is suspended for the game against Iceland so I had to balance the squad up by taking out a striker and bringing in defensive cover. Unfortunately for Jamie he was the one who had to drop out,” he revealed. Last month’s win against Luxembourg (1-0 away) and the famous victory over Spain in Albacete have helped to build an even greater spirit in the panel, according to Baraclough, and he believes the outside chance of getting to a play-off is a great incentive for his squad.